The Big Bang Theory, like every other long running comedy, has had problems with turning its characters into stereotypes. I don’t know why it happens, maybe it’s laziness on the parts of the writers and/or actors, or maybe it’s something they think the audience wants “they laughed when X happens, so do it more and do it bigger!”. Either way, that’s where they start losing me. Too often it pushes the characters from being extreme but credible to being charicatures and unrealistic. The Big Bang Theory has been heading in this direction for a while. Characters could reasonably be expected to mellow with age, with the extremes of their personalities rounded off a bit as they meet more people and experience more life, but instead they get odder and odder. It makes the characters seem alternately stupid and cruel. Sheldon, despite supposedly being in a relationship and being surrounded by ‘functional’ people like Penny and Leonard who have repeatedly told and shown him that his behaviour is inappropriate, continues to be selfish, rude and hurtful. It makes him seem mean, and it makes the other characters seem foolish for continually associating with him and trying to change him. But then, as if an alarm goes off in a character’s head, they take a step forward – Sheldon inches his relationship with Amy closer, Penny realises what she wants in life, Raj learns how to be in a relationship. It feels like fireworks should go off. These moments are so sweet and lovely, so elegantly written and true to the soul of the characters that other missteps are forgiven. Until the next time and then with a sigh I find myself seeking out a clip of a highpoint and remind myself of the good. The writers have made some improvements at least. Amy’s obsession with Penny has been toned down and Penny’s increasing familiarity with science and geekery are a refreshing acknowledgement of how long she’s been with the group. I wish they’d smooth Stuart’s character out a little and make more use of him, I like his addition to the group, I guess we’ll have to see how integral Raj’s girlfriend becomes but I hope it will last as that will be an interesting direction for the character. I don’t really see myself giving up on the series, it’s pretty much the only sitcom I watch and it’s easy to slot in during the week. But they need to make sure that they keep hitting those highpoints regularly enough to keep me forgiving the low points, and if they could maybe avoid the low points a bit more often, that’d be great too. I wonder whether there’s an expiry date on sitcoms. As any series gets older it becomes harder to keep things fresh, while not making so many changes that the series becomes unrecognisable. As the years pass it becomes increasingly unlikely that the characters would all still be in the same place, the same jobs, the same friendship groups, the same domestic situations and more tellingly, making the same mistakes. Many dramas get stuck in a rut of endless running through the same procedures with different guest stars and window dressing, but with a comedy you’ve got the added pressure of making the whole thing funny. 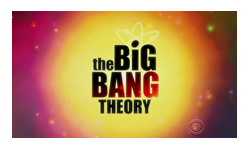 What’s strange is that when I started writing this review, I was all set for a lament about how that applies to The Big Bang Theory, but now as I come to document the evidence, I’m wondering if maybe the complete opposite is true. Actually, The Big Bang Theory HAS managed to avoid many of the common pitfalls while still staying true to its original pitch. The addition of Amy and Bernadette, and even the tentative inclussion of Stuart the Comic Shop Guy, and recurring characters like Kripke and Lucy, have broadened the potential of the show. While it’s true that the characters are broadly in the same jobs and same situations, and the friendships between the group haven’t changed much, the romantic relationships have and each of the pairings have matured satisfyingly. While characters do tend to take 2 steps forward and 1 step back, they are at least still making steady, if slow progress forwards. The moments in the show that demonstrate character growth are really lovely – Sheldon and Amy moving forward in their relationship, Penny telling Leonard she loves him, Raj talking to Penny, the less girls playing Dungeons and Dragons, or discussing comic books to better understand the guys. Each of those moments proves that not only can the characters age and grow, but they can still be funny while they do it. They’re moments that I re-watch and chat about with friends, and they’re timelessly endearing. That all sounds great, so why was my first instinct to launch this review with talk about expiry dates? The problem is I think that while the memories that stick are the real highlights of the show, when I watch week to week I’m overwhelmed by the frustrations that leave me wanting to hide behind cushion. Raj is a particularly difficult character, with his jokes about money and India feeling increasingly uncomfortable. Sheldon has made some big steps forward (for him), but it’s the leaps backwards where he comes across as downright mean and inappropriate (the whole HR storyline). For the moment, there’s enough there to keep me coming back for the next season. It will be interesting to see how the group have coped without Leonard for a few months and that should provide some great material, allowing the show to investigate what it’s like without one of the characters, without actually being without them. For now the potential and the good outweigh the short term frustrations, and this is still the only comedy that I really watch. So fingers crossed they keep moving in the right direction, even if it is very slowly.